Bob Hawke became Australia's 23rd prime minister when the Labor Party won office, replacing the Liberal-National Party government led by Malcolm Fraser. Bob Hawke was an optimistic prime minister, driven by the certainty that he could negotiate solutions to intractable problems and communicate with people from all walks of life. He was also a pragmatist, generally willing to allow his ministers a 'light rein' and to change course as circumstances required. Hawke was a Rhodes Scholar in 1953 and graduated from Oxford University in 1956. He became well known as an advocate for the Australian Council of Trade Unions (ACTU) and, from the late 1950s, presented the annual cases for higher wages to the Conciliation and Arbitration Commission. Bob Hawke was the ACTU President for a decade from 1970-1980, and President of the Labor Party from 1973-1978. In 1980 he was elected to the House of Representatives for the seat of Wills in Melbourne and in an unusual step, consistent with his background and public profile, was immediately appointed Shadow Minister for Industrial Relations, Employment and Youth. He became leader of his party on the day a general election was called in March 1983 and won a landslide victory in that poll, the first of four election wins. He was Australia’s longest-serving Labor prime minister but, while his party was still in government, lost the leadership in December 1991. He resigned from Parliament two months later in February 1992. A national summit meeting of leaders of business, industry, government and trade unions is held on 11 April 1983. The meeting discusses overall economic strategy, with a focus on the pressing issues of unemployment, inflation and wages. The Australian dollar is floated on 9 December 1983 and the international market begins to set the exchange rate and value of the Australian dollar. Australia's second universal health insurance system, Medicare, is introduced on 1 February 1984 and becomes entrenched as a key part of health policy. The deeds to Uluru were presented to traditional owners, the Pitjantjatjara people, by Governor-General Sir Ninian Stephen on 1 October 1984. Uluru is managed in a joint arrangement between the local Indigenous community and the National Parks and Wildlife Service. The Accord is extended with unions moderating wage increases in return for tax cuts and superannuation entitlements. The Australia Act passed on 2 March 1986 ended the inclusion into Australian law of British Acts of Parliament, and abolished remaining provisions for appeals from Australian courts to the Privy Council. Building on earlier moves towards superannuation for all workers, the Hawke Government's 1989 retirement income policy statement argues for 'twin pillars' of age pension and private superannuation. The Higher Education Contribution Scheme (HECS) was introduced on 1 January 1989. The scheme was designed to shift part of the cost of higher education from the Commonwealth to students. The twelve founding members of the APEC Forum meet in Canberra on 5 November 1989 for the first time. ATSIC is established on 5 March 1990 as a Commonwealth statutory authority. It aimed to give Indigenous people direct involvement in administering government programs and provided for the election of Indigenous representatives from regional land councils. The deployment of an Australian naval contingent to the Persian Gulf is announced on 17 January1991, in response to Iraq’s invasion of Kuwait in what becomes the First Gulf War. The Hawke Government set out to change Australia, having learnt from the successes and failures of past governments. Critical to this was the early decision to harness the full capacity of the public service, rather than holding it at arm's length from policy development. Legislative and other successes included Medicare, Landcare, the Prices and Incomes Accord, the Family Assistance Scheme, the initiation of superannuation schemes for all workers, the formation of the Asia-Pacific Economic Cooperation forum (APEC) with 21 Pacific Rim Members, the deregulation of the financial sector, and the announcement that Advance Australia Fair would be the National Anthem. Across the Hawke governments Aboriginal affairs received considerable attention, as did the environment, while higher education was transformed and equal opportunity acquired a national emphasis, including through legislation against gender discrimination in workplaces. Hawke brought his ACTU negotiating skills to his very public role as Prime Minister. While his authority within the Party was unquestioned, he also achieved consensus within government ranks, was politically astute, provided advice on what was electorally acceptable, and brought diverse groups to the negotiating table. While able to persuade his ministers and members to support policy changes, he relied on the considerable support of his Treasurer Paul Keating and Industry Minister John Button to achieve economic reform. Other Ministers, too, were drivers in their portfolios in what was viewed as a reformist government. At the grassroots level Labor Party members were at times critical, notably in relation to his siding with the airlines during the pilots’ strike and his willingness to cooperate with business interests. His leadership was damaged, the electorate was becoming disenchanted with the recession, and he was successfully challenged at the end of 1991. 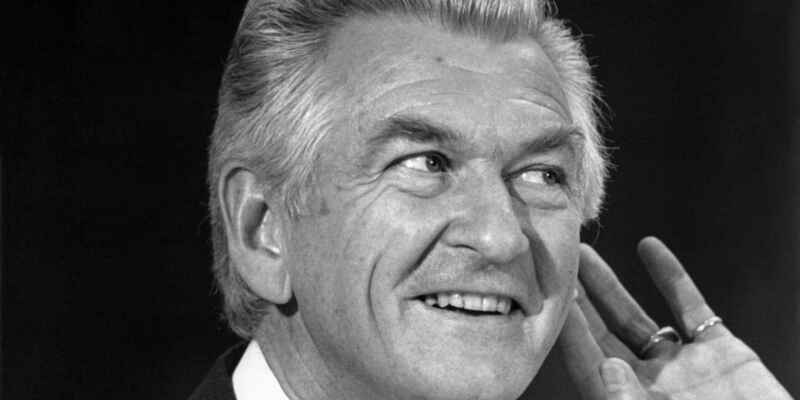 The 1983 Accord between the government and unions, led by Bob Hawke and ACTU Secretary Bill Kelty, was a landmark agreement. It was achieved at the end of a difficult process for both bodies, at a time when the economy was stagnating. Kelty, whose support was vital, recorded that it was an exercise in changing people’s ideas; that the Accord opened the economy to the world, improved real wages and produced an effective minimum wages system, but promised that the living standards of all sectors of the population would be maintained. 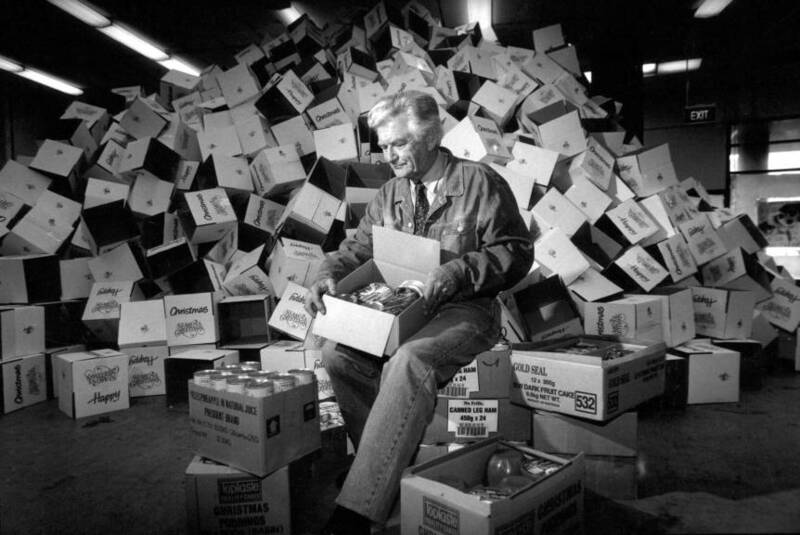 Full employment, reflecting the interests of the government and the union movement, was the primary aim, but its political success allowed Hawke’s government to restrict wage demands restraining wage growth, and to re-cast social policy including the health system. Bill Kelty was central to the operation of Hawke’s agreement with the union movement. Bob Hawke’s admiration for West Australian tycoon Alan Bond was well known when Bond's yacht Australia II won the America’s Cup for Australia in September 1983. Hawke considered that Bond had lifted the national spirit with his win at a time when the country was in economic decline, but united around this 'marvellous historic victory'. 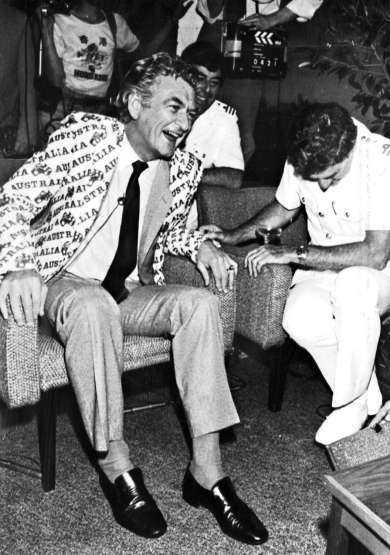 Known as ‘Bondy’ and ‘Hawkie’, Hawke wore his highly recognisable Australia jacket, and joked and laughed with Bond in Perth during celebrations at the end of the race. Hawke also memorably stated that Australians taking a day off to celebrate the victory should not be penalised. Thanks to Dr Auriol Weigold for her contribution to this page. ... our history has shown clearly that "give and take" - the fair-go - is most readily attained if the economy is expected to grow and if, in turn, the fruits of that growth are seen to be shared fairly. Bob Hawke, Speech to the National Press Club, 22 January 1988. The tag is cut: how will the Trump-Turnbull spat damage the alliance?